STOP!!! This is the Wholesale Page for Tools - Glue, Needles, & Other Useful Tools. Minimum total Wholesale Order is $100.00*. Items may be mixed throughout the catalog. The $100.00 minimum does NOT include shipping and handling. Please stay on the wholesale pages when placing a wholesale order. Thanks! E6000 Glue - adheres to wood, metal, concrete, masonry, ceramics, rubber, glass, & plastic - waterproof & paintable. Glue will keep longer if kept cool. Refrigerate when not using. 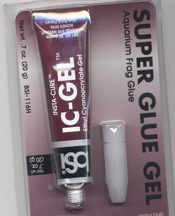 Insta-Set Glue Accelerator - 2 oz. Bead Tip Cement - jewelry cement - dries water clear - glues plastic, beads, ceramic, glass - seals knots between beads - medium strength cement - sets in 10 minutes (will not bond fingers) - 1/3 fl. oz. Choose size: 1 1/2" 2"
T-Pins straight pin with T head 12 /pkg. Push Pins - Cushioned pins used to pin materials to a mold. 12 /pkg. Triangular Outside Spine Needle for bookbinding 1 1/2"
Triangular Outside Spine Needle for bookbinding 3"
Coiling Needle: metal #13 - 2 3/4" (larger dia.) 2 / pkg. Coiling Needle: metal #18 - 1 7/8" (small dia.) 3 / pkg. Coiling Needle: metal #20 - 1 7/8" (thinner than above dia.) 3 / pkg. Chenille Needles #18 - 3 / pkg. Slightly sharper tip than our tapestry needles. Good for coiling projects. Chenille Needles #20 - 3 / pkg. Beading Needle Wires - wire with large round eye that collapses when passes through bead. 3 1/2" long. 3 to a pack. Quilters use them to stitch from either direction. We have been told they work well on some coiling projects. These make great round awls or can be used as "natural" needles. Kumihimo Disk - 4 1/4"
Rubber finger rings to aid in pulling needles through coiling, quilting & other needle work, beading, etc. Hot Tool - Wood burning tool that comes with extra fine stencil tip. Great for signing or decorating even the smallest baskets. Comes with 4 bits of various sizes. Crank - "egg beater" - style drill. Great when electricity isn't available. Picture Frame Pliers - Useful in starting brads in Nantucket or other nailed rims. Needle File Set - Case with set of 6 different shaped needle files. Case serves as handle, and files store inside. with pocket clip. Burnishing Tools - Use in wire & metal work for folding and bending. Straight or Curved blade. Flat Egg Sander - Use these to sand rims and handles. Bench Block - 4" x 4" x 1/2" - finely polished case-hardened steel. Ideal for flattening wire, laying out work, or chasing. Miniature Horn Anvil - small steel anvil. Great for flattening and pounding wire. Plastic / Metal Mallet - metal mallet with detachable plastic ends. Magnetic Board with Ruler - Magnetic board with magnetic ruler. Ott Lite - w/ true color bulb. Portable w/ carrying handle. This is a terrific light! Table Magnifier - Magnifier with goose neck. Has heavy solid base to sit on table. Clamp-on Magnifier - Magnifier with goose neck. Clamps onto your work surface. Magnifying Visor - OptiSight with 3 lens - 3 power, 4 power, & 5 power. 3/8" wide Velcro One-Wrap - 2 sided Velcro - sticks to itself. Cut to the length you want. Great for tying together bundles of reed, seagrass, etc. Can adjust as you use the material! Available in 5 or 25 yd. rolls. 1/2" wide Velcro One-Wrap - 2 sided Velcro - sticks to itself. Cut to the length you want. Great for tying together bundles of reed, seagrass, etc. Can adjust as you use the material! Available in 5 or 25 yd. rolls. The loom graph paper works well for charting out waxed linen patterns. Beeswax Stick - .15 oz. - pure beeswax in a handy to use tube! Caning Awl same as regular awl. Shaker Tape Weaving Tool Curved wooden tool. It is also great for putting in bark seats. Available in 5/8" or 1" widths.